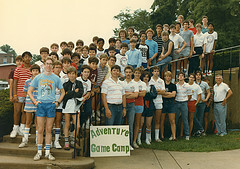 By popular demand, I’ve uploaded the other group photos I have from the Shippensburg Adventure Game Camp. Were you there? Find yourself in the crowd and be amazed how you looked 25 years ago. I’m missing photos of one of the weeks in 82, 83, and 84. If someone out there has those, let me know so we can make the set complete. 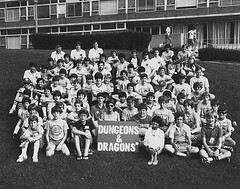 The rest of the photo gallery has a few more gems, like the letter announcing the cancellation of the camp and the test they sent campers to gauge their knowledge of AD&D. 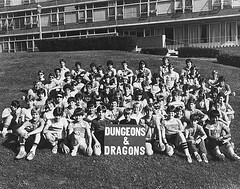 UPDATE Added pictures for the other sessions in 82 and 83, courtesy of fellow councilor Todd Goldman. So now the only missing photo is the other week of 84. Thanks Todd! Yes, it’s the ring quest adventure. I assume you have all these adventures in the archives and don’t need me to scan it in? And, no, I have no clue who my DM was, pictures won’t help. I always had my photo, and wouldn’t have even remembered in 1985. @Mr X — Is that the Ring-Quest adventure? You may be able to pick out your GM if you take a close look at the pictures. The councilors are along the back in most pictures, except the lower right 1985 picture where they are beneath the stairs. I’ve been looking for stuff on the net related to this camp for a while.. always surprised there wasn’t something out there.. well, finally. How about someone start a facebook group or something? I don’t personally utilize any of these gaming oriented sites.. and I’d assume a number of other folks don’t either. Nathan’s Shippensburg memories are up too. We intentionally schemed for him to write all his recollections before reading my or the other accounts, just to see how all our memories of the camp lined up. Really interesting read. Wow, how many times did you move the box that held all that great 25 yr old material! Regarding the quote, it really doesn’t sound that bad – considering. However, given that we all had more than our fair share of jocks beating us up emotionally if not physically, I can see how we took his comments as more pointed than they were probably intended. I think I was able to track down Dr. Kraus’ current phone number and perhaps Larry’s too. I haven’t confirmed that they are accurate – but it would be really interesting to interview them to get their perspective on the camp. That’s an interesting quote because while it’s insensitive it doesn’t give me the impression that he meant to be as mean as it came across given his comment about Ivy League schools and be important behind the scenes. I dug up another gold mine of Shippensburg stuff, including the lists of all attendees (from the weeks I was there anyway), my DM notes and player character sheets, the works. I also found a complete scan of the article covering the camp, the one where Dr. Kraus stuck his foot in his mouth. Some cross-checking makes me think the article really came out in 1984, not in 1985 as I first believed. So maybe it didn’t lead to the downfall of the camp after all. There was definitely a lot of anger from the campers, but Dr. Kraus kept running the camp for another year. “These are the wimps, the kids who are probably the outcasts in a high school class, the last kids picked in a group,” says Kraus, a tanned, tousled 50-year-old who also runs a tennis camp at Shippensburg. “But they’re the ones who are going to go to Ivy League schools and will end up running things, or at least be important behind the scenes. They’re very bright. Yeah, the blond hair with the part in the middle. Greg check out the Shippensburg interview I did. It should answer a lot of your questions. Although not an attendee, I think this is a great story and certainly worthy of an article of some sort. So it ran for 5 years? How many weeks/year and roughly how many kids attended overall? I’m interested in beginning and end. Other than a popular new game, what/who was the impetus behind bringing the camp together? 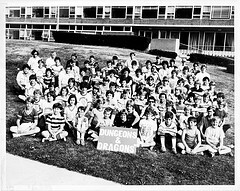 On the other side, what is the sense that the moral panic surrounding D&D was the reason for the cancellation? 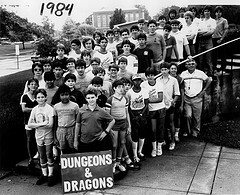 Todd gave me the pictures for the other sessions of 82 & 83, so the collection is nearly complete. Christopher — Are you the one with the blond hair? Kameron — Going out of business prices. Books were cheaper back then (I think $11 for a PHB?) but not that cheap. Sweet! Now I can stop feeling bad for not finding my pictures. I’m in that lower left picture above middle right in a black shirt. Wow. 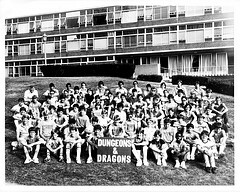 Look at the prices on those AD&D books. That alone would have been worth attending the camp. Did they sell the books each year, or was this just a “going out of business” sale? @ MJ Harnish — Yeah, these things wax and wane. I’ll email you about Fight On. @ BJ — Not many, but some. You can see them if you look through the pictures. Where there any girls in the camp? Those are some great pictures Ben. I’ve been getting a lot of hits & pingbacks lately about the story which is kind of surprising given the amount of time that’s passed since the story first appeared. On a related note: I’m pitching the story to Fight On! since I think it deserves a wider audience and likely would be of great interest to the typical FO! reader. Interested in collaborating a bit more if the editors are interested? That would be great Todd! I’ll email you at the (hidden) address you posted and we can figure it out. Nice pictures! For some reason I never got the 1985 color photos. It took me a while to spot myself in them. Gotta love my fashion choices back then. I have the other photos from 1982 and 1983. I guess I was attending in the weeks you weren’t there. Let me know how best to get them to you. BTW, there were two girls in our group in 1983. They were quite the rock stars.